Can an independent country share a currency? The Elgin Marbles depict the mythology of ancient Greece. The modern myth is that sovereign Nations can be bound together by a single currency. Greece must avoid replacing one myth with another- that returning to the drachma will be a panacea. If and when the drachma returns it will not be the notes and coins issued by the State free of debt which will be the problem, it will be the new drachma denominated debt issued by the privately controlled international banking system which will hobble Greece to its present masters. 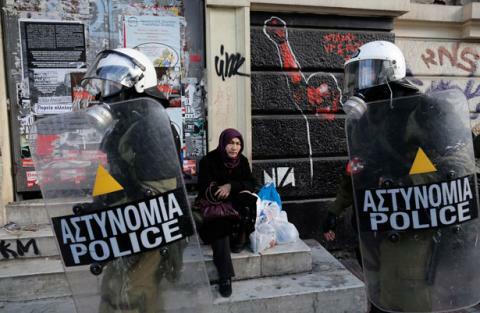 It is not just the EU which is Greece’s nemesis. It is the IMF, the WTO, the TTIP, the rating agencies, the faceless financial markets, indeed the entire house of cards which now dominates our Western democracies and dictates the neo-liberal economic dogma which divide societies and rationalises self-destructive austerity. These are the global institutions which will dictate the nature and values of Greece’s future economy – not its government and not its people. Whether we use pounds, euros, dollars or pesos all official money has a shadow currency – the credit issued by these private banks. Yes, the State accepts all the responsibility for its National Currency and indeed its taxpayers also guarantee every penny of the shadowy debt issued by their privately owned banks, but they have no control whatsoever over this debt money which constitutes over 95% of all money in circulation and forms the core of our artificial National Debts. Greece, and indeed any other sovereign State can recover its independence but only if it retains its currency within its own borders. That way no unauthorised parties can manipulate its value or speculate against it. That also provides a constant reality check because it obliges a balance of trade, keeps international moneylenders at bay and returns the currency to democratic accountability. The social dividend from this may take a few difficult years to deliver but the destiny of the Greeks, rich and poor alike, will at least be back in their own hands. Such matters have nothing to do with socialism, capitalism or the redistribution of wealth, they are to do with moneylenders and a fraud upon the people. As for the outstanding euro creditors – they should ask their governments to authorise the debt to be written off their balance sheets. For the most part that can be done with little pain and as readily as it was written into their overstuffed balance sheets in the first place. That may disturb the illusion which is fractional reserve banking, but that would be just another myth displaced by reality. A Grexit on this basis would start a chain reaction – not just affecting the euro but all currencies. This because it would demonstrate that Sovereign Debt (debt denominated in a foreign currency) and National Debt (in one’s own currency) can be written off both sides of banks’ balance sheets without the world coming to an end. That in turn would expose the entire house of cards which is fractional reserve and also the madness of government bonds bought with bank credit. The magnificent Ponzi scheme might then be immortalised in another marble frieze more significant than any relic from the Parthenon. If the Greeks summon up all their courage for this Referendum and back their new government to stand its ground and default, they must also find the nerve to legislate for Constitutional money and outlaw fractional reserve banking within their borders. There is no half-way house, The people have a unique opportunity to decide whether their country is to be run by bankers or an elected parliament. To this end the new Greek government must also widen its circle of financial advisors. If they go to the established fonts of wisdom they will be speaking to the very people who created or endorsed the present arrangements which have so signally failed. They must seek other ‘experts’ who dare to think outside the box and perhaps even more importantly they must ensure the people they govern are fully informed that money and banking can only work for everyone when everyone understands what is going on. Of course all this is heresy to the Establishment and will be resisted by all the considerable means at their disposal. Unfortunately neither politics nor economics is a science and so myth, whether from the ECB, the Federal Reserve or the Bank of England, will continue to suppress reason. Still, what irony if the country where the word Democracy was born also conceived its rebirth. Thank you, Ronnie Morrison, for this excellent, critical, article. Keith Hart and I have written a closely related article as a chapter on Money and Banking in ‘Northern Neighbours: Scotland and Norway since 1800’, which was published in April by Edinburgh University Press and edited by myself, Ottar Brox and Lesley Riddoch. In this we advocated a multicurrency system for a future Scotland, which would include a Scottish national currency. I am sorry that we did not know of your essay when we wrote this. Certainly agree with what you say on your website and will follow with interest. I however think there is so much we should be doing now regarding economic resilience. We should be looking into more innovative ways of trading. I don’t necessarily mean going down the block chain road, but seriously looking at things like mutual credit clearing such as ‘WIR’ in Switzerland, and obvisouly local money. The more educated people are about the true essence of money, the more comfortable they are likely to be with a new currency. One of the most important point to arise out of your proposition for an independent Scottish currency is that as it is an article of membership for any new country joining the EU to agree in principle to join the Euro, Scotland would have to also leave the EU as they would fail to meet the entrance criteria. How are Salmond and Sturgeon going to sell that given all they’ve said about the centrality of EU membership to Scotlands future? A particularly un-informed, un-educated but not totally un-founded observation would be that Western societies have been living well beyond their means for decades. In doing so both individuals and governments have placed themselves increasingly in the hands of those we now decry. A trip down memory lane to the 1980’sbrings back comment from good old Willy Brandt, ex-German Chancellor. In a report commissioned by the EMF into third world poverty if I remember correctly, his findings were that to alleviate that poverty, the west would have to drastically reduce it’s living standards; no television, video recorder, fridge freezers, holidays abroad or second car. In the light of that, to plead for an end to ” austerity” is laughable. As individuals we all want more and we want our Governments to provide us with it. In doing so we fuel the desires of the less fortunate to beat a path to our door and wonder why. Will Greece bite the bullet and for how long ? It’s not a bullet it’s an artillery round that we ourselves are not too far away from equalling in our present state. Shout and cheer for Scotland’s future by all means, but I fear we will be required to face an austerity of considerable dimensions. Strong government and a willingness to make sacrifices( which many will not be prepared to do) will be required if Scotland is to succeed as a nation. In it’s presently divided state, that looks ominously doubtful. Excellent comment. I would suggest that it’s not so much ‘the west would have to drastically reduce it’s living standards’ (which suggests that it is something that the west would choose to do) so much as ‘the west’s living standards will be drastically reduced’. The barriers that stopped Northern/Western wealth from leaking to the Southern/Eastern countries have proved to be porous, as improvements in IT, communications, education, transportation etc mean that it is possible to have work carried out for less cost elsewhere. To further complicate matters, many people who come from countries with lower wages are adding downward pressure to western wage levels. To my mind the western public haven’t grasped the fact that their day in the sun is over. Those politicians who have grasped it don’t know how to tell us! Google ‘$135 $12 the pay gap the west can bridge’. That extra ‘t makes all the difference!! First class comment; looking to have the letter T re-introduced to our vocabulary as well. Seems to have been replaced by an apostrophe by an ever increasing number of people. Well Mr. T that was a quid well spent ($135-$12) and should be made compulsory reading for those who wish to dictate monetary policies et al. I think it’s a great article, and as valid now as it was in 2012. I work for an American tech company, and in the 1980s we paid our developers a share of the product revenue. One guy had a (good!) private plane. More recently our CEO announced that the going rate for an analyst programmer was what we paid in India. In the space of 30 years we’ve gone from millionaire coders to Indian wage levels. IMHO what put a lot of soft Noes (like me) off was the underplaying of the complexity & timetable surrounding the transition. I still do not really know if Yes a) really thought that it would be simple, or b) realised that it would be very hard and downplayed it to avoid scaring people off. The lack of thought around the currency management system was simply the most visible manifestation and one that people hooked on to. Aye just like the ‘austerity’ faced by the Bankers & co who cost the British taxpayer £900 Billion and waltzed away singing and laughing: how do you explain these robbing cretins who are truly criminals and they get off scott-free while mainly the poor and vulnerable are to be tortured and blood squeezed out of them like they are stones by the inhuman callous ideological vermin in Westminster who love to beat the crap out of the poor while using all this Ponzie scheme crap as a pretext to inflict pain in the name of fiscal responsibility? Any idiot who has studied economics for 5 minsutes knows that fiscal responsibility is ECONOMIC DESTRUCTION. Adam Smith would birl in his grave at the arseholes who speak in his name pretending to be capitalists, when all they are is gangsters crooks and down right criminal thieves. I agree we all need to learn to live more simply, with no more than our fair share of what the planet can provide. The key word there, I think is “all”. Austerity policies are almost invariably targeted on the poorest, unfortunately. This is particularly unfortunate because according to a report by Oxfam last year, it is the wealthiest whose spending has the greatest impact on the environment. How does cutting public services help combat climate change, global injustice, or environmental degradation? An excellent post. Though I don’t agree with everything Ronnie Morrison says, its central argument is clear and unavoidable – a country can’t be truly independent AND share a currency. The current situation in Greece rather proves the point. And that’s why the SNP’s arguments for a currency union with rUK during the referendum debate were, I’m sorry to say, deeply fraudulent. An independent Scotland needs an independent currency. sadly we will never know. All Scotland’s wealth was basically handed to Westminster by the unionist parties. We were fed lies. Promises and even vows. I believe we could carry on as we have with the Scottish pound, as for the banks leaving Scotland. If that’s what they want fine. We need to nationise rail and postal. Use industry to get the people working for their benefits. Greece’s debt is, and will continue to be in Euros, not Drachmas. A Drachma / Euro exchange rate is anyone’s guess, but a bankrupt government setting up a central bank with no foreign currency reserves with which to stabilise Drachma exchange rates doesn’t bode well. Is the sabre rattling by the EU, IMF and banks designed to bring the Greeks into line and or bring down their legitimately elected government? I wonder when the last time we saw a larger neighbour screaming at and bullying a smaller country to adopt it’s way of thinking. We all remember the banks and insurance companies and their threat in the summer of 2014. One of Ronnie’s main points relates to secrecy, living in London and walking round the city, Canary Wharf or the South Bank all you see is cranes. The finance industry is fuelling this activity, but what do the people that buy these properties do and contribute to society? The converse of this point is transparency, wouldn’t it be nice to be able to plan your financial future with confidence that you not being conned? Thank you for the informative and forthright ideas put forward in this article. To see a positive vision of respite from the destructive behaviour of the troika in Greece is always welcome. The Greek citizens may have an opportunity to bestow a largesse on the European financial stage with the upcoming referendum by forcing the creditors hand on this issue. As much as the pain of a grexit is real and concerning, how can the people of the country acquiesce to a future of never ending austerity. To their state being governed by unelected technocrats in far off lands. To allow their democratically elected representatives be rendered mute by the mighty power of troika legislative whitewash. In fact much more insidious is the drip feeding of neo-liberal dogma, like a slow poison, into the very fabric of a state undeserving. Anathema on the house of those who oppose. More directly, your comments about the widely misunderstood monetary systems imbrued upon us could not be more astute. Fractional reserve banking is the great destroyer of value. Bubble ridden “bank deposits” sap the life and value from our economy. Our entire monetary policy is dictated by the whims of coked up financiers with scant regard for the real, productive parts of our economy; all the while unnecessary destruction and suffering through ideologically driven austerity wrecks the lives of millions. We must continue to educate ourselves and those around us about the very urgent need of monetary reform and the possibilities we have to make money work for us once again. Greece may well be the birthplace of this new democratic money…if we’re lucky. So if there is no traded/ exchangable currency how does anyone go abroad???lol? Bloody establishment, stuck in its ways! Well Fittie I can agree with your final sentence but otherwise I think you illustrate very well that everyone other than the present elite of academic economists and bankers need to open up the debate about money and banks. Greece is undoubtedly running a deficit in its balance of trade – and so are the bulk of the EU, not least the UK (since the oil price collapse). Even Germany is in debt to its banks and it is debt which destroys people and enterprise. Manageable debt is OK for individuals (mortgages and sensible credit card use) but we are talking here of ‘institutionalised debt’ where all money is ultimately borrowed from bankers. Yes, Greece will not be able to borrow cheaply to subsidise foreign imports if she reverts to the drachma – the converse of that is what has caused the crisis. But the lender has as much responsibility as the borrower, in fact probably more, and only lends as a business risk. If they lose out then that’s hard cheese for both and a lesson learned. Greece will have a year or so of having to live within the capabilities of its domestic economy – as did Iceland. But a bit of hardship does no one any harm and often brings out the best in people (I can remember the war and (provided you survived) we were name the waur o’ it. Fair enough, if I was Greek I would vote to leave the Euro even thought the debt would still remain and it would be in Euros not Drachma. And i think the only choice is debt relief. I feel for the normal Greeks, the teachers and pensioners but writing off Greek debt isn’t victimless either…they don’t just owe to the IMF but to many other states who are struggling themselves, Portugal, Spain, Ireland, Eastern countries…what do they do? And if you give debt relief to Greece, why not Portugal, Spain, UK etc? Although I think the banking system and national borrowing should be regulated (but by whom?) collapsing the system by ‘universally wiping the slate clean for all’ would destroy millions of lives around the world and besides you would need the USA and China to agree. If Greece goes for the drachma the lenders cannot enforce repayment in anything other than drachmas, so the immediate heat is off and the opportunity for economic recovery opens up – but it will have some short term pain whereas another loan to pay of the last one will just postpone the inevitable. On you query about non-convertibility of the drachma that simply infers that the Greek Central Bank conducts the forex market in drachmas and because there is no cash available outside Greece speculators cannot settle deals independently. Malaysia did this very successfully in the Asian financial crisis in the nineties. Anyone claiming to forecast the detailed outcome of the Grexit should be taken with a pinch of salt but much can done to keep a transition on the tracks (sse http://www.scottishmonetaryreform.org.uk). Some of this might be heavy going but be assured it is understandable and a lot easier than trying to justify the machinations of the present hegemony. Do you accept that an Independent Scotland that created it’s own currency would as a consequence, void Scottish membership of the EU, as it is a condition of new membership that the applicant country must also agree to join the Euro? Do you think that Sturgeon and Salmonds leadership could credibly survive if they backed down from their belief in the centrality of EU membership for Scotland? Could you, and a growing band a ‘Independence’ campaigners, credibly be lead by a leaders who weren’t prepared to give Scotland economic independence (to say nothing of the far deeper political ramifications for Scottish independence that EU membership entails)? Sorry for the delay in responding Patrick, you make several good points. There are eleven independent currencies within the EU of which most are pledged to join the adopt the euro at some future date (a pledge almost indefinitely postponed in several cases). An independent Scotland could not join the Eurozone whilst it retained Sterling – other than in the unlikely event of a special case being made as new members are required to join the ERM for a minimum of 2 years and demonstrate that they can operate within the exchange rate limits laid down. That means a Scottish Currency in any case. The SNP nailed its colours to the EU mast as securely as they did to the Bank of England. I hope this was political expediency rather than a considered commitment. The embarrassment over the latter last year – which many think affected the result, and the present state of the former coupled to the coming in/out EU referendum would, I think, provide wriggle room for an altered policy on the next occasion. I would also hope that a campaign to insist upon an independent Scotland demanding new banking laws would also include a serious examination to the debt money system which is at the heart of so many threats to genuine capitalism and democracy. Finally I do still believe that the SNP remains the one political party wjere the members at Annual Conference can influence basic policy. One of the finest articles ever printed on Bella! Thank you Ronnie. I hope the people of Greece vote to come out of this farce and go it alone, I am with them all the way, Indeed Scotland should have gone with its own currency in the white paper, all this neoliberal corporate scaremongering doesn’t wash with me. The white paper gave the outlined plan for Independence,Next time we need a well thought out transparent in depth description on every detail to include a pathway for new Independent Scottish banks. Great read!! it needs to be out there for all to read front and centre for the next time. I’m minded to say that true sovereignty involves having your own sovereign currency. Wonderful article. Just asked Alexis Tsipras via his Twitter a/c to read it too. Not just Greece, but all Euro countries are ill equipped to manage the economy as the exchange rate tool is no longer available. In the long term, the Euro cannot be maintained and will pull the EU apart in a rich northern and a poor southern zone. The EU are galloping towards a transfer union, a constant stream of money going from north to south. Greece is merely one example. The only solution for Greece is the Drachma which can be devalued to reflect the perceived value of the economy. Remember Germany between the world wars? Zimbabwe? Argentina when the peso was pegged to the dollar? Iceland? All of these hopeless cases reached a solution in the end by devaluation. The involvement of loan sharks, international finance organisations and other obfuscants did not help Greece In the slightest – on the contrary. As the Euro is such a pet project, it is maintained at all cost. What a surprise that you fail to mention another entry in the very same Wolfson Economic prize you mention. That of Mathematically Perfected Economy, the singular integral solution to 1) inflation and deflation, 2) systemic manipulation of the cost or value of money or property, and 3) inherent, irreversible multiplication of debt in proportion to a vital circulation, engendering inevitable systemic failure at a finite system lifespan defined by an inevitable, terminal sum of insoluble debt. Mathematically Perfected Economy™ is every prospective debtor’s right to issue their promise to pay, free of extrinsic manipulation, adulteration, or exploitation of that promise, or the natural opportunity to make good on it. To the best of my knowledge only the top 5 entries were published by the selection committee. I have skimmed the theory in your link and it appears to refer to the mathematical impurity of fractional reserve banking, and that I fully agree with. Full reserve however is, in my view, sound in this respect as is the principle of traditional Building Societies and Savings & Loans. I made Positive Money aware of this article, and they have added it to their facebook and twitter pages – the article deserves the widest circulation. During the referendum we staggered (imho) around discussions on what currency might be adopted, sterling, euro, or a new Scottish currency. If this article and the work being done by Positive Money and others causes us to think much deeper about an alternative to how money, in reality debt, is created, and opens up a debate, then it is a debate which is long overdue. I think Greece will be well cared for by mother Russia. And that’s the real fear of the banksters, and of course the good old USA who have succeeded in driving Russia and China together, which I am sure was not the what the state department had planned. Who would have though that in my lifetime I would get to see America disappearing up its own arse unlubricated “ouch” that’s gotta hurt bad. How much joy can I endure? keep it up Americunts I can take all you can give. (a) Join the Euro – thanks to the books being thoroughly cooked by Germany and France. (f) head to third world status within the next decade.